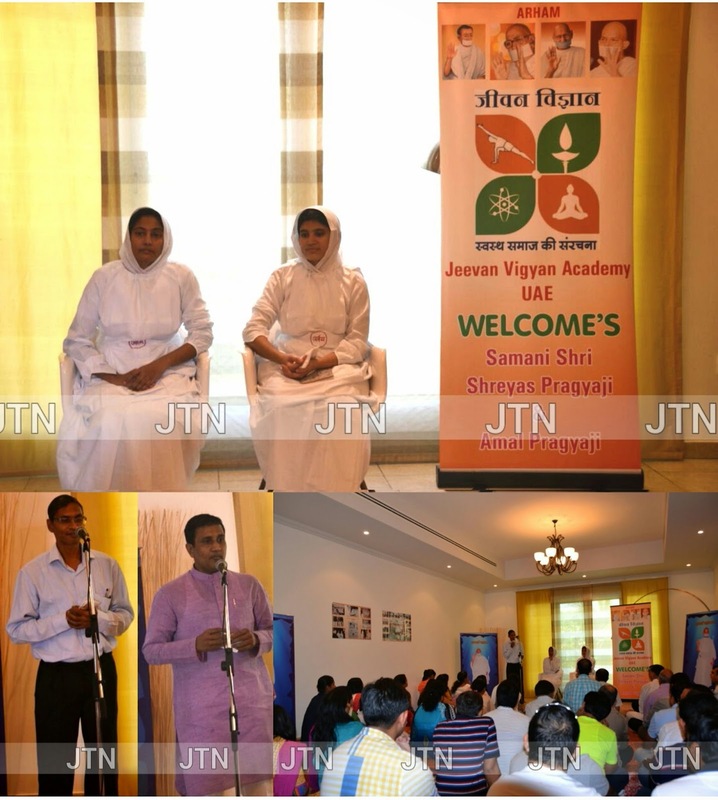 We welcomed Samaniji in UAE. Rakeshji Bohara, Dinesh Kothari, Rachana Bohara and Santoshji Mutha expressed their feelings. Then she narrated an incident about a child who asked god "O God, you gave something special to these famous people but you didn't give me anything." God said "Dear child, I have given everyone the same gift. Some people used it very well and became famous, others didn't use properly. So, everyone can make his dreams real and achieve what he wants. for this the dreams or goals should be specific. We should have deep faith in achieving them. Even if obstacles come we should not stop. We should make strong efforts in achieving these goals or dreams. Then Samani Shri Shreyas Pragyaji narrated a small incident. A train passenger called one small boy who was selling water and asked for price of a bottle of water. The boy just smiled and went away. The passenger asked other tarvellers why this child smiled and went away. One wise person answered if you needed the water badly you could have taken the water bottle, drank the water and then asked the price. But you didn't need the water badly so you asked price first and child smiled at you and went away. Similarly, if we want "Moksha or salvation badly, we should be trying hard to achieve it without asking for its price." Samaniji mentioned that she just completed her PhD and the award function is will be held in November. She will be missing this award function. But for her serving the community is more important so she agreed to miss the function and came to Dubai for serving the community in Dubai. She mentioned 4 things are difficult:- 1. To watch ourselves and find our own mistakes. 2. Accepting and Correcting our own mistakes. 3. Having patience. 4. Thinking and doing welfare of others. Then we did few experiments. Samaniji asked 2 -3 people to stand up and remember and speak names of people whom they know in the hall in 1 minute. People spoke different names. Samaniji asked why didn't you speak your own name. You forgot yourself. Never forget yourself and your soul. What are we doing for proceeding towards moksha / salvation. We have to reduce our "Kashaya - Anger, greed, ego, deceit", otherwise we can't reach salvation. Then Samaniji briefly mentioned stories of Shravak Anand, Mahashatak, King Shrenik and Duryodhan. She said that Swadhyaya and Meditation are good ways of reducing "Kashaya". Then we practiced following meditation:- 1. Mahapranh Dhwani 2. Sit in a comfortable posture. To keep the back bone straight spread the knees so that both the knees are on the floor. 3. Take deep breath 4. Inhale for 3 sec and exhale for 5 sec. 5. Inhale then hold for sometime then exhale. 6. Inhale hold exhale hold. Meditation increases the generation of Alpha waves in mind which are good to increase the energy level of a person. By keeping eyes open many nerves are being used, which consume energy. By closing the eyes we save that energy.